Having little kids while making art is hard. At age three, my youngest daughter managed to climb up on a high counter to serve herself chocolate chips, trimmed her own hair with a pair of safety scissors, and stole the food coloring to run upstairs and Jackson Pollock her bedroom. That phase--from walking up until about age 4--has been one of the most difficult phases for serious artmaking as a mother. It's certainly among the most intense phases of motherhood; physically involving and unrelenting. Babies and toddlers just don't understand your needs. --all while depending on you to provide for their needs. So one of the things I do to make up for that is to find ways to welcome kids into my art space. This requires that I both a) communicate clearly about what they're allowed to do AND b) lower my expectations for the amount and types of things I can accomplish with them around). For older kids, this can be a talk and tour of the artspace, and setting up their own supplies so they can feel involved. Toddlers are more tricky, because you have to welcome them almost 100% of the time, simply because of their level of development. But I still set firm boundaries about what is theirs and what is mine. What that ends up looking like is that my art studio gets temporarily baby-proofed, with dangerous materials moved well out of reach. Of course, I ensure that my kids have access to similar washable versions of my supplies so they don't feel as left out. 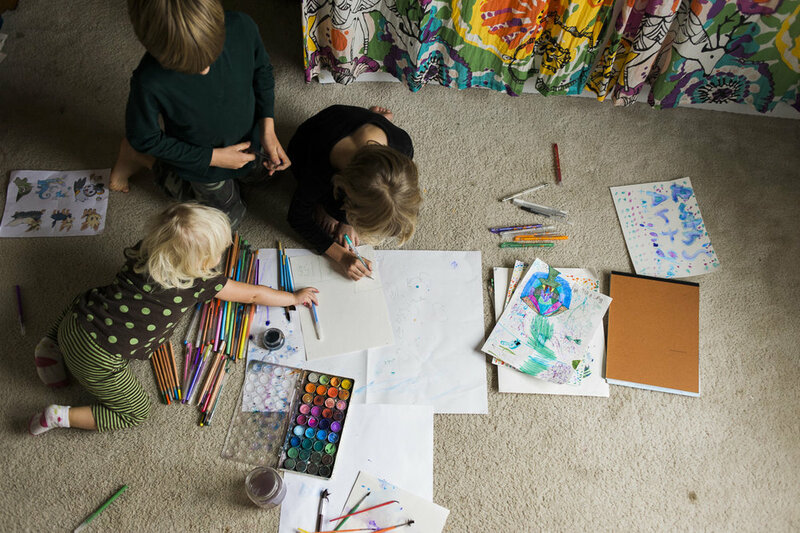 I let my kids draw on my studio floor behind me to keep them occupied in parallel with my artmaking. Even with that, kids will always want to use the grown-up tools, because there's magic in the grown-up tools. So you have to be watchful. You have to be patient. Your artspace may have to contain both your mess and theirs for a season or two. And adapting to having kids in your artspace will change your art practice. You have to choose activities where it's okay for you to be interrupted, and where a spill isn't going to put your children in danger. You must add buffer time because things will take longer than you intended. And that's okay. It's frustrating from time to time, and it's natural to feel that way. There's nothing "wrong" with your toddler or with you, or with your kids. And in spite of the challenges it's been neat to see how my kids and I bounce off each other. My youngest will try anything and everything because she doesn't know she isn't supposed to do that. My kids don't know that a sketchbook is for anything in particular, or that there's a way to do it. And one day, when I saw my eldest daughter agonize over what to paint, I told her, "Just paint," I said, "and you'll figure it out!" Later on that day I found myself fretting: I need to create more work! I thought. What am I going to do? What's my big idea? Welcoming kids into my art practice has done this: it's made me more aware of how the work itself is the only thing that leads you. I can't think my way into great work. I have to work my way there. Learning how to structure the art practice around children has helped me create more space for my work. And sometimes letting my toddler in helps me to shake up my ideas, pushing me to bigger & better things. Join my newsletter to get the latest news on available works, events, and workshops, plus get a FREE PRINTABLE work of art!